I've mentioned before. I have a serious croissant obsession. There's something so satisfying about the flaky exterior, peeling back the ribbons of dough in the interior and savoring every buttery bite. There's some debate about the best croissants in LA and some felt that it was a close tie between Amandine and Bite, thankfully both in my neighborhood. I gave Bite a try a couple weeks ago and came to the conclusion that their croissant (when heated) was a force to be reckon with. Now, I had to give Amadine's a good ole college try. 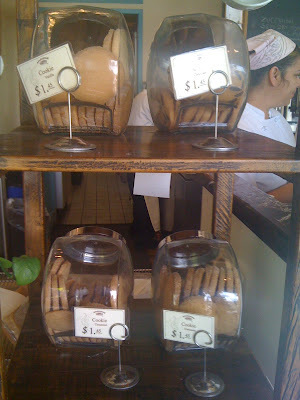 I've driven by Amandine a couple times on weekends and it always seemed crowded and really not worth the effort. 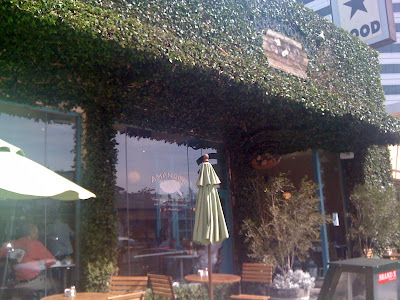 However when I recently got a weekday-off (thanks to my company for our 4 day memorial-day weekend), I decided to check out Amandine since there wouldn't be much of a crowd except for the rich Brentwood housewives, fortunate enough to be brunching in the middle of the weekday. 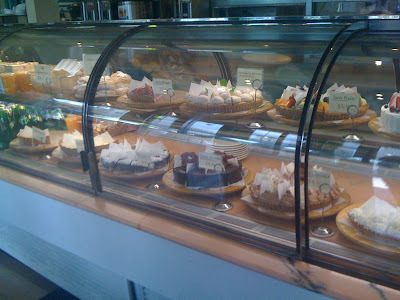 Amandine Cafe on Wilshire offers freshly baked goods daily and you'll find just about anything your hearts desire. Since I was about to hop on a plane to SF (yummy dinner blog entries to follow! ), I didn't have much time to make a meal out of this. 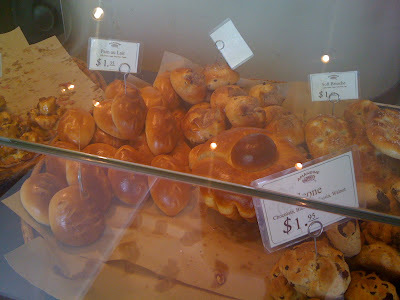 They had regular and chocolate croissants, as well as mini croissants. I opted for the latter so that I could order something else. It's hard to avoid their dessert selection but I remained strong. Oh, and their homemade cookies would have been a perfect airplane snack. 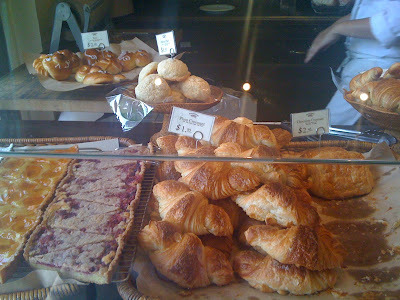 I decided on the mini croissant and a Kouign Amann. I had to go with the Kouign Amann because I saw a fresh batch coming out of the oven, and this pastry is something that I rarely find in LA bakeries. Kouign Amann is a dessert from Brittany, France. Since this was fresh from the oven, it was still warm inside. The pastry had a caramelized sugar coating and a somewhat crunchy crust which held its shape even after I broke it down the middle. It had a nice golden brown coloring on the outside and was filled with soft apple chunks inside. This version was actually a bit different from the one I had at a bakery in the walled city of St. Malo in Brittany when my parents and I crashed my sister's honeymoon (but that's another story). The Breton version was purely all dough with no apple filling. I'm usually not an apple-dessert kind of person but the apple filling in this Kouign Amann was reduced till soft and wasn't as sweet as I had expected. Something about the warm apple filling and golden crunchy sugar sprinkled crust reminded me of an apple strudel, not the German kind but the Aussie kind that my dad used to carry back with him from his business trips to Perth. Now on to their croissant. It was actually cheaper than Bite's. The regular sized croissant was $1.95 compared to almost $3 at Bite. Unfortunately, Amandine's version wasn't fluffy and the ribbons of dough were stuck together. It didn't melt in your mouth. However the taste was quite good. It had a sweetness to it and had a flavor that was not akin to butter but tasted a bit like a mild cheese. The Verdict? The croissant wasn't as good as Bite's. I preferred the buttery flavor of Bite's croissant. But then again, perhaps Amandine's might have been better if they had heated it up a bit. I guess we'll never know. Or.. I guess I could hit it up again this weekend to do another round of primary research.